Last year celebrity Arnold Schwarzenegger released a video of himself crushing various objects with his own M47 tank. This week he has released another tank themed video, this one showing him crushing things with a Centurion tank. The video is part of the Omaze charity program. The video does not identify the owner of the Centurion tank used in the filming. The website for the popular “Panzerwrecks” photo books is displaying a message that series publisher William Auerbach passed away suddenly on April 16. Mr. Auerbach was known for authoring many books and articles presenting photographs of WW2 German armor. He was a frequent contributor to the AFV News bulletin during it’s publication run, his first article there appearing in the March 1978 issues. Over the years he worked with several other writers on books about German armor, including Thomas Jentz, Lukas Friedli, and his partner on the Panzerwreck series, Lee Archer. The Panzerwreck series includes 18 volumes published from 2005 to the present, collecting and presenting WW2 era photos of knocked-out German armor. Soldier’s Memoirs – 50 different soldier memoirs in various formats. Lafayette Pool – A page dedicated to US tank ace Lafayette Pool, containing his own writings as well as various articles about him. Feature Articles – An index of almost 60 feature articles about the 3rd Armored Division. General Maurice Rose – A page of information and resources about 3rd AD commander Gen. Maurice Rose, the highest ranking US officer to be killed by enemy forces during the war. Breaking Defense has posted an article stating that the 2nd Cavalry Regiment in Europe wants 81 of its eight-wheel-drive Stryker infantry carrier vehicles fitted with 30 millimeter automatic cannons. The article notes that the 2nd Cavalry wants the weapons because it’s the Army’s frontline force in Europe. There are only two US combat brigades still based on the continent, the 2nd Cav in Vilseck, Germany and the 173rd Airborne in Vicenza, Italy, a light infantry formation with very few vehicles of any kind and nothing as heavy as a Stryker. Since Russia seized Crimea, both the 2nd Cavalry and the 173rd Airborne have deployed to the Baltic States. 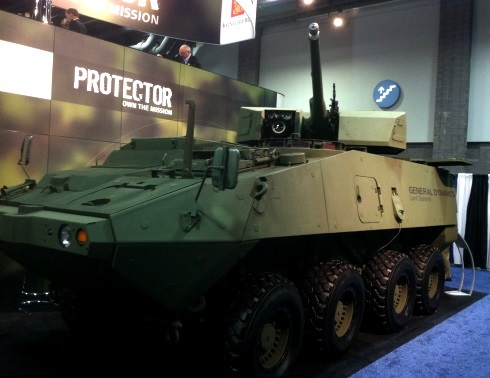 Currently the Stryker is armed with a .50 caliber heavy machine gun. The Defense Department has been reportedly testing the 30mm “medium caliber remote weapons station” developed by Kongsberg Protech Systems and General Dynamics Land Systems since 2013. Read the full article from Breaking Defense here. From the Editor: Lights First Every Time? 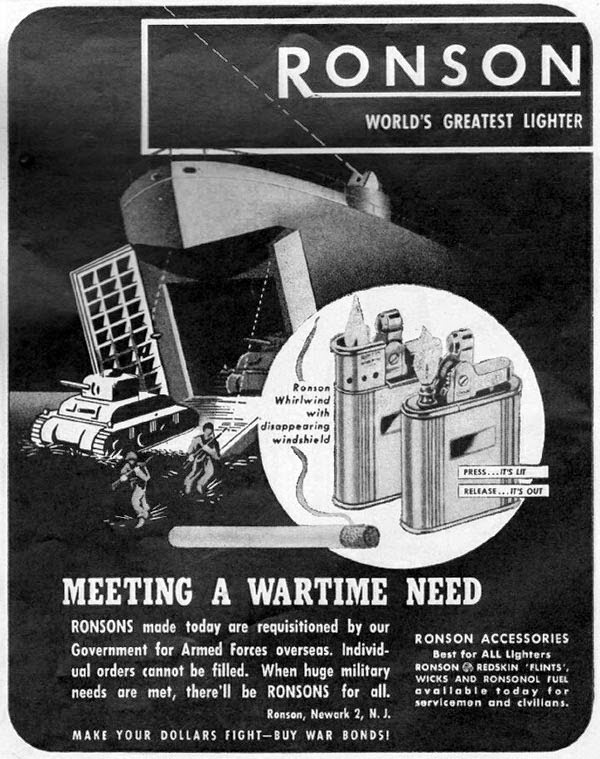 Most people familiar with the history for of the M4 Sherman tank have heard the story that the British nick-named them “Ronsons” after the famous cigarette lighter due to the flammability of the Sherman tank. The story goes that the troops co-opted the Ronson slogan of ” lights first every time” to describe their vehicles. This story has been reported in many books and TV shows about the Sherman tank. Certainly, the idea that the Sherman was uniquely susceptible to burning is a bit of a fable. According to one common version of the myth, the Sherman burned easily due to the fact that it used “high octane” gasoline while its German opponents used diesel (the most famous example of this myth is in the Academy Award winning film “Patton”.) In reality, the vast majority of German tanks and armored vehicles used gasoline engines and the Sherman ran on the same 80 octane fuel as every other US Army vehicle. When a tank is penetrated by an armor piercing shell and brews up, ammunition is the most common culprit, not fuel. The Sherman got a bad reputation in the early stages of the Normandy campaign for catching on fire in part due to improper stowage of ammunition. Once the US introduced the “wet stowage” system of ammo storage into the M4 Sherman, the rate of tanks that burned when hit decreased significantly. So what does this mean? Not much really. 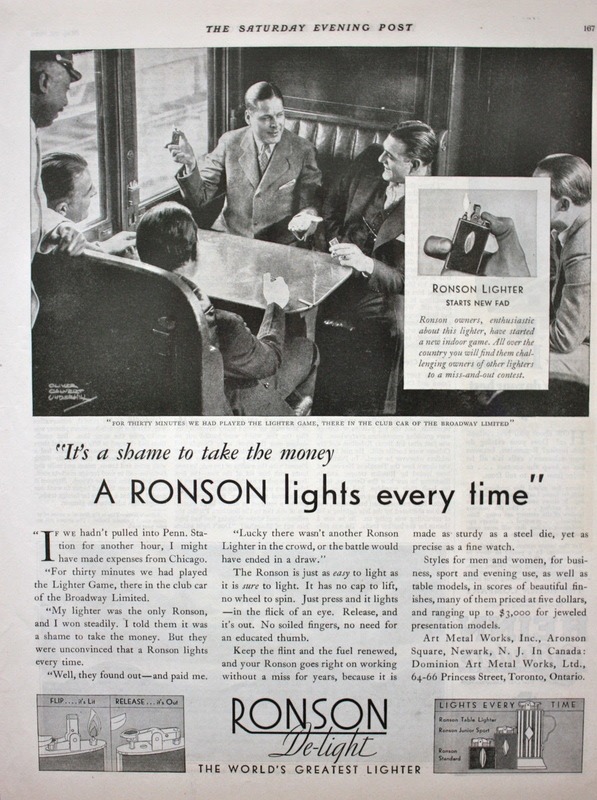 Perhaps the “lights every time” slogan was used in a radio jingle and not in print ads. Or perhaps the troops mistakenly attributed the slogan to the Ronson brand. However, based on the available print ads its probably fair to question the validity of the “lights every time” myth. For those wanting to examine a large number of Ronson ads arraigned by date, please consult this page.